So, do some of us make drastic decisions via spread sheets, and computer models? We sometimes 'believe' our grand plans by letting machines validate our extreamism. So when will we release the machines to live out our pathogies? The Machine as our de-humanized avatar? I wonder if it'd be possible to take a moral lead and declare that auto-firing on a target is only allowable when the target is in the act of commiting a crime such as kidnapping girls to sell them, or in the act of commiting some kinds of non-state-approved (e.g. terroristic) lethal crimes against humanity, as we would normally allow police forces to follow through on. And/or how about allowing for termination of other crimes against humanity while they're in the act or imminent, such as internationaly owtlawed use of chemical warfare? And there are a dozen other issues of what should be considered tolerable acts during war or crime enforcement. What's special about drone weaponry, other than their ability to limit destruction to pinpoint targets rather than the more traditional, imprecise and more random destruction? Does anyone remember when the phrase "human shields" was first coined? Brutal, bullying leaders even bragged that they were intentionally hiding combatants among innocent civilians. use of human shields iz hardly even newsworthy any more, but is expected behavior. If technology can outsmart that kind of despicable, inhumane tactic to reduce civilian casualties, I'm for it. What's special about drone weaponry, other than their ability to limit destruction to pinpoint targets rather than the more traditional, imprecise and more random destruction? The flipside is that, in the case of the drone, the person deciding to terminate the target is doing so through a narrower lens. Instead of killing a person before them, the killer is remotely dictating that a machine terminates a person; it makes killing without feeling possible. At least in your example though, there is still human thought put into each act of killing. Killing without feeling? I don't know, unless you mean that killing-without-fear-of-being-killed feeling. Drones are actually more precise. Remember how we killed before drones? Bombs and artillery. Most of the people killed in most battles before drones were killed by artillery (canon, rocket, and mortar fire). We tend to think of the killing being done by soldiers with rifles, but actually that's not the way modern wars are fought for the most part. The difference is that today we see recordings of drone strikes which kill a few people sometimes in addition to the target. But that's better in many ways than dropping ordnance blindly out of the bay of a B-52. In a strange sense, drones have made ware MORE personal, not less. Yes we do not need a real life scenario of Terminator. May sound far fetched now, but you never know how well technology can increase to allow such things in the future. Plus we need to do away with anymore killing machines. We must work towards a more peaceful society. That will happen as soon as we convince countries to lose wars. What if 'WE' just plan to have a 'nice day', is there something wrong with this? I can think of N^k things to do that might be very nice, not trash the planet, help us grow 'bigger souls', deepen our good minds, and not mis-use our intelligence for more ugliness. Don't we already have killer robots, such as landmines and similar independently operating machines? It's going to be very tricky to distinguish which machines fit the description of LAWS. Or have they already figured that out? Land mines are explosive devices not really robots. 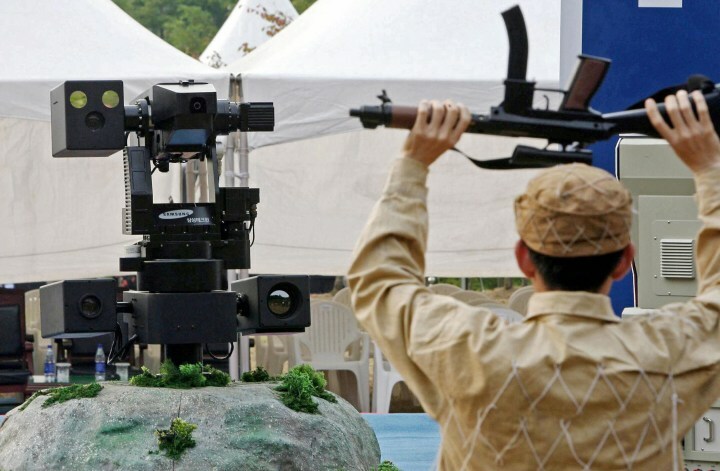 A sentry robot freezes a hypothetical intruder by pointing its machine gun during a test in Cheonan, South Korea, on September 28 2006. What if snensing and intelligence could be added to land mines to not blow up kids? Yes, maybe if you can produce your driver's license when asked the mine would then blow your feet off. Easy enough to do. Weight sensors for the pressure plate triggers, or size parameters for silhouette style visual targeting. The problem is it wouldn't be cost effective. A lot of countries signed the Ottawa Treaty. The list of those who refuse to sign is telling.